Kendra learns pasta making in Father Joe’s Villages’ Culinary Arts Program. When Preston lost his job of 14 years, he wasn’t prepared for the difficulty of finding another job, nor did he have enough savings to sustain his family for a long period of time. When his partner, Kendra, lost her job a few months later, their situation became desperate. Being responsible for three children made the prospect of homelessness even scarier, and Preston fell into a deep depression. While the family was living on the streets in the East Village, a Father Joe’s Outreach Supervisor spoke with them about checking into our family program, they welcomed the opportunity to leave the chaos of the streets. Preston was expecting to find a safe place for his family to stay. He wasn’t expecting to rediscover his passion. His commitment to being a good father is what motivated Preston to enroll in Father Joe’s Villages Culinary Arts Program (CAP) immediately after moving in. 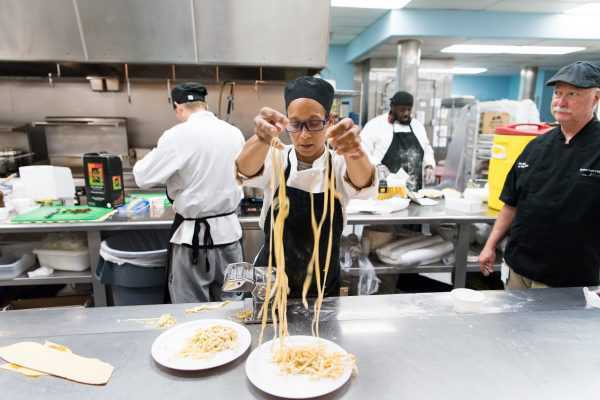 Father Joe’s Villages’ sector-based vocational training programs, including our long-standing Culinary Arts Program, not only teach the skills needed to work in sought-after industries they also teach the expertise required to apply for jobs and succeed in today’s competitive job market. Preston has had an interest in cooking since he was a child. It is a passion he learned from his own father who was in the military and used to cook for thousands of sailors. With the help of Father Joe’s Villages, Preston found that he could now finally turn his passion for cooking into a career. “At Culinary Arts, I learned certain techniques I didn’t know before: knife skills, cuts of meat, but also being on time, treating people with respect. The program helped me with interviews and speaking in front of a group. Chef allowed me to be myself. I appreciate everything he taught me about life, not just cooking,” Preston shares. During his time in CAP, Preston poured his energy into his culinary creations and was able to meet other future chefs who shared in his passion. He relished the opportunity to cook for others, and enjoyed seeing their satisfied expressions after trying his food. Soon after Preston enrolled in CAP, his depression subsided, and he quickly found a job as a line cook at a busy restaurant in downtown San Diego. Preston isn’t the only successful CAP graduate— In 2017, 92% of CAP graduates received jobs in local restaurants. Preston & Kendra’s children benefit from Therapeutic Childcare while they engage in employment services and look for work. Preston, Kendra and their children will be moving out to their own housing as soon as they’ve saved enough to guarantee their security. Preston says that the experience of being homeless and his time at Father Joe’s Villages has changed his outlook. He is still enjoying his job as a line chef and focusing on being the best example he can be to his children.